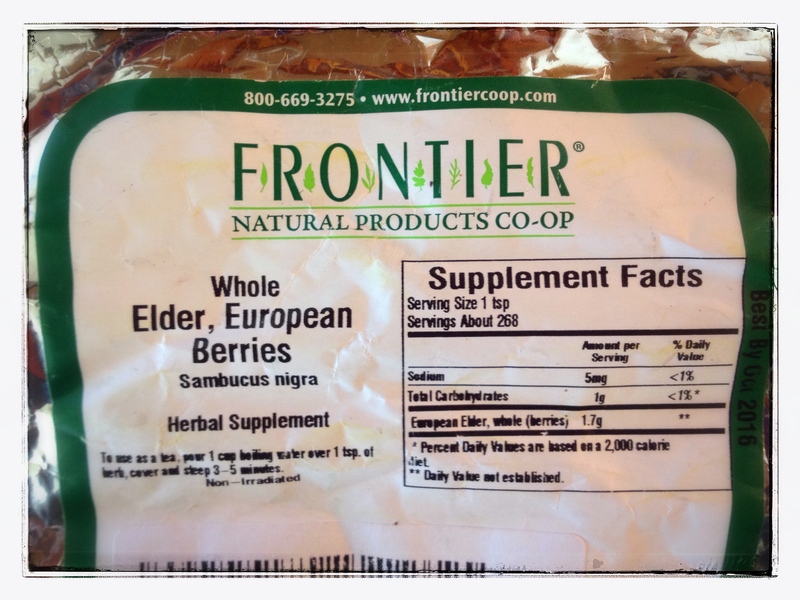 Elderberry, or Sambucus Nigra, is a berry plant native to Europe that has been shown to help prevent and treat the flu, cold, and other respiratory ailments by boosting the immune system. The berry is high in vitamin C, as well as other vitamins and minerals. 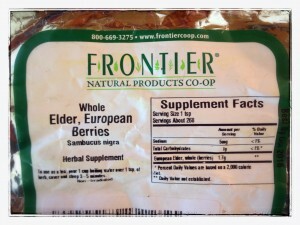 I tried some elderberry syrup for the first time when I felt a cold coming on sometime last fall. Not only were my symptoms much less severe than with previous colds, but the symptoms overall didn’t last as long. It seemed to really help my kids and husband as well. I knew this was something I wanted to try again the next time I was sick but the price tag was discouraging (like $12 on sale for an 8oz bottle), especially when I would be sharing a bottle of syrup with a husband and two kids. It is far more economical to buy your own dehydrated berries for making homemade syrup. I purchased a whole pound of berries from Amazon, which I’ve made four batches from so far and I still have enough left for about one more batch. 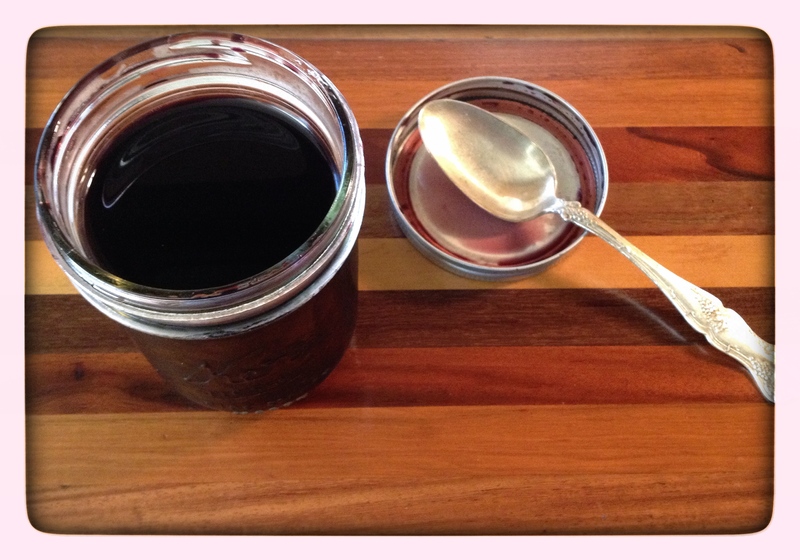 I’ve even made elderberry syrup gummies for my kids that I will write about in a subsequent post. The recipe I used, with some alterations, is from the Wellness Mama website.It is: 2/3 cup dried elderberries, 3 1/2 cups water, 2 Tablespoon fresh or dried ginger root, 1 teaspoon cinnamon powder, 1/2 teaspoon clove or clove powder, 1 cup raw honey. In my own recipe I used ginger powder because I didn’t have root, and I also added turmeric powder (for it’s anti-inflammatory benefits). I left out the clove because my husband doesn’t like the taste. And did you know there are different types of cinnamon? There is actually one that is known as “true cinnamon”, and it’s not the one we typically find at the store. You have to look for “Ceylon” cinnamon to get true cinnamon. If it doesn’t say “Ceylon”, then it’s actually “Cassia”, which supposedly doesn’t have the same health benefits as Ceylon (I’ve found Ceylon cinnamon at New Seasons, Whole Foods, and Amazon). And now back to my recipe: I also didn’t use as much raw honey in my syrup; only about 1/2 cup, instead of a full cup. Raw honey has many health benefits, so adding the full cup would be great. I haven’t done so because I like to give my kids a spoonful of honey when they have sore throats since it helps to soothe their throat (and they think they’re getting a treat). I’ll also add it to their tea. Since they’re getting raw honey in other ways, I don’t add as much to the syrup. The syrup without honey is pretty bitter, but I’ve found that 1/2 cup of honey sweetens it well enough that my kids don’t give me the bitter-beer face when they drink it. The syrup-making process is simple: bring 3 1/2 cups water to a boil, add 2/3 cup elderberries, ceylon cinnamon, ginger (powder or root), +/- turmeric and clove (whole or powder), stir, then reduce to simmer, leave uncovered for about 45 minutes, remove from heat until it has cooled down a bit (warm). Now you’ll strain the juice out of the pot by pouring your mixture through a strainer into a bowl or jar. Add the honey and stir. Toss the berries into your compost pile. As soon as we feel a cold creeping up on us my husband and I take 1 tablespoon several times a day, and we give the kids 1 teaspoon several times a day until all symptoms have disappeared. I keep our syrup in a pint size mason jar with lid and refrigerate it. I have been amazed at how well elderberry syrup has worked. The first couple of times I used it I remained skeptical, but the third time I was convinced. I despise cold medicine and will only use a nasal spray at night so I can at least breath (and breathing equals sleep), but since I started taking the elderberry syrup when I get sick my symptoms are so mild that I don’t even need any nasal spray. Even my kids have much milder cold symptoms with the syrup. And with as often as little kids get colds, this syrup has been priceless.